The funerals coincided with an official government announcement that President Bashar al-Assad had appointed Adel Safar, the minister of agriculture for the past eight years, as the new prime minister. Mr. Assad had announced the resignation of the entire cabinet last week in response to protests across Syria demanding reform. It was unclear whether the appointment of Mr. Safar, 58, would be more than window dressing, as many of the president’s promises of change since assuming office in 2000 have been. Government opponents said that although Mr. Safar was not considered corrupt, he had been minister of agriculture since 2003, and before that was the head of the ruling Baath Party branch at the University of Damascus, where he was dean of agriculture. “Same old politics,” one critic said. Douma and several other cities where there were large demonstrations on Friday, including Lattakia and Homs, were tense but quiet after a series of funerals, residents said. Syrian security services had largely withdrawn from Douma and did not interfere with funerals there and in other places, said residents and human rights activists reached by telephone. But people in Douma were simmering because official news reports said the deaths were caused by unidentified armed gangs, who were roaming the streets and shooting at people until the state security services intervened. Protesters said the armed gangs and the security services were one and the same. 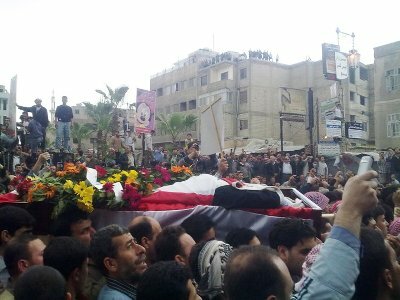 In the central city of Homs, four victims of the violence — two women and two young men — were buried on Saturday, said a human rights activist in the city, also asking not to be identified for his own safety. “There were little protests for each burial, with people chanting, asking for their rights, but it stayed pretty small and calm, and security forces did not intervene,” the activist said. 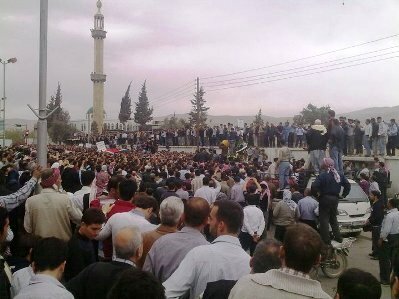 Residents of other Syrian cities said communications to Homs appeared to be blocked. It was difficult to call there and other places where there had been antigovernment protests. 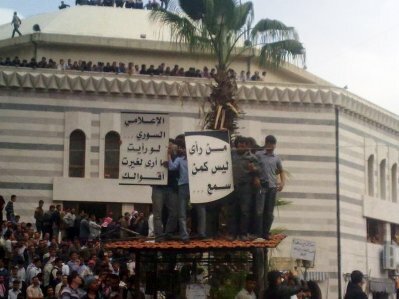 The southern city of Dara’a, where the protests against the Assad government started more than two weeks ago, was reported to be quiet on Sunday. With security services still surrounding the city, some protests erupted in outlying villages, residents said. More than 100 people, nearly three quarters of them from in and around Dara’a, have been reported killed since the unrest began, human rights organizations said, and scores of arrests continue. A joint statement published online on Saturday by eight human rights groups said at least 46 people had been detained during raids in Dara’a, as well as in Douma. This corrupt to the core, dictatoriship, who used to treat people like its slaves, for almost 50 years will not give up its priveleges without a fight, without committing more crimes and spilling more blood. 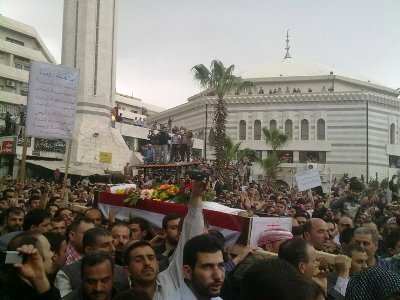 In the same time this corrupt dictatorship will collapse by the will and sacrifices of the great Syrian people. Victory to the Great Syrian people, Freedom and democracy to Syria.